SCENTED FLAMELESS CANDLES home decor, jewelry, decor, decorations, electronics, fountains, floor mats, art glass, vases, garden essentials, fireplace screens. 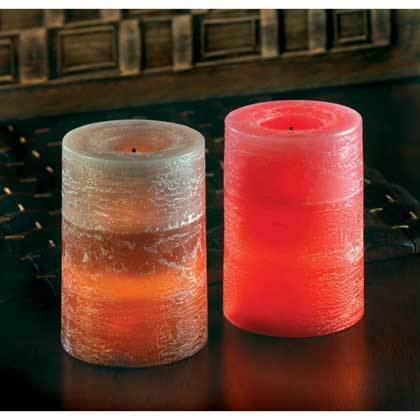 The layered look is hot and trendy, making this candle a stylish decorating choice! LED bulb safely adds the lifelike warmth and motion of candlelight, but without the heat and hazard of open flame. Three separate earthtone gradations and subtle spicy wood fragrance add extra-special touches. Material(s): WAX - PARRAFFIN LED LIGHT PLASTIC. Weight 0.4 pounds. Dimensions 3" x 3" x 4". Red-hot cinnamon heats up all sides of this earthy pillar candle without the open flame! This realistic LED candle adds the warmth of flickering light and can be used over and over again for endless enjoyment. A simple, stylish way to spice up your décor with a punch of color and the playfully sweet scent of cinnamon candy. Material(s): PLASTIC WAX - PARRAFFIN LED LIGHT. Weight 0.4 pounds. Dimensions 3" x 3" x 4".